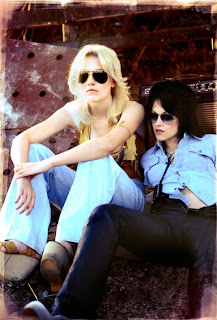 Yesterday I saw the film, The Runaways, a music-fueled coming of age biopic of the groundbreaking, all girl 1970's rock band The Runaways. The movie chronicles the years from 1975 to 1977, beginning with band's formation, their meteoric rise to fame under the Svengali-like influence of rock impresario Kim Fowley, and ending with lead singer Cherie Currie's eventual crash and burn, and her exit from the band. The original band was formed in 1975 by drummer Sandy West and rhythm guitarist Joan Jett who on separate occasions introduced themselves to producer Kim Fowley about starting an all-girl band. Fowley gave Jett's phone number to West, and helped them to fill out their band with bassist Micki Steel. The band started as a trio playing party and club circuit around Los Angeles. The following year they added lead guitarist Lita Ford and lead singer Cherie Currie to the lineup. Bassist Steele left the band, and her spot was filled with first Peggy Foster, then Anne Boleyn, and finally Jackie Fox. The Runaways were signed with Mercury Records in 1976 and their debut album, The Runaways, was released shortly after. The band toured and played numerous sold out shows. After their second album, Queen of Noise was released in 1977 the band began a world tour. The Runaways arrived in Japan for a string of sold out shows, but bassist Jackie Fox left the group and was eventually replaced with Vicki Blue. After Currie left the band Jett took over lead vocals full time. In 1978, over disagreements about money and management, the band parted ways with Kim Fowley. Bassist Vicki Blue left the group and was replaced by Laurie McAllister, but The Runaways played their last concert on New Year's Eve in 1978 and broke up in April 1979. 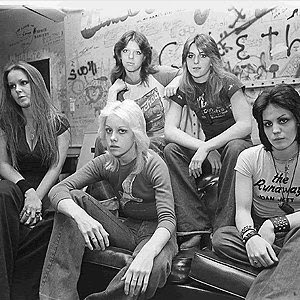 The Runaways had a hit single called Cherry Bomb, a song that Jett and Fowley penned on the spot at Cherie Currie's audition when she arrived with a song they didn't know. 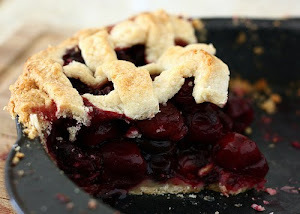 In tribute of the song I've included a Cherry Pie recipe. Who doesn't love cherry pie? It's also one of the easiest fruit pies to make. Fresh tart cherries are best but in a pinch (or out of season) one 16-oz can equals about 2 cups of tart cherries, or 3 cups of frozen cherries equals a fresh pound. Make the dough; divide in half and form each half into a disc. Wrap each disc in plastic wrap and refrigerate for at least 1 hour. Position rack in lower third of oven and preheat to 425° F.
Remove 1 dough disc from fridge. Butter or spray pie pan. On a well-floured surface or between two sheets of plastic, roll out first dough disc to 12-inch round. Transfer to 9-inch deep pie dish. Trim dough overhang to 1/2-inch. Place in fridge. Pit all the cherries and place them in a medium bowl. Sprinkle sugar and cornstarch over the cherries and then pour the water and lemon juice on top. Add almond extract. Gently mix until no trace of sugar or cornstarch remains. Leave for 15 minutes and then drain the cherries of most of the liquid. Roll out second dough disc on well-floured surface or between two sheets of plastic to a 12-inch round. Using a pastry wheel with fluted edge, cut ten 3/4-inch wide strips from dough round. More detailed instructions on lattice top pie crust can be found at simplyrecipes. Transfer filling to dough-lined pie dish, mounding slightly in center. Dot with butter. Arrange dough strips atop filling, forming lattice; trim dough strips overhang to 1/2-inch. Fold bottom crust up over ends of strips and crimp edges to seal. Brush lattice crust (not edges) with milk. Sprinkle lattice with remaining 1 tbsp sugar. Place pie on rimmed baking sheet (to catch juices) and bake 15 minutes. Reduce oven temperature to 375° F. Bake pie until filling is bubbling and crust in golden brown, cover edges with foil collar if browning too quickly, about 1 hour longer. Transfer to rack and cool completely. Serve with a scoop of vanilla ice cream.